This interview was originally to be published for my birthday event during August but due to my head injury I never got the chance! A massive thanks to the author for taking the time out to answer some questions! I hope everyone has enjoyed the Kahlen Aymes! It was fate. Truly. I worked in media sales and when the economy tanked in 2009, my job at a major newspaper was eliminated because several of my accounts either went out of business or severely cut back their advertising budget. To make a living, I designed a web site for online coupons but needed to market it. One day, my hairdresser couldn’t stop gushing about Twilight and even though I rolled my eyes, I read the books with my 9 year old daughter. A light bulb went off; these women were my target market! I found that there were a hundred thousand fan fiction stories, some with thousands and thousands of reviews. I thought… “I can do this.” So…I wrote a story, never expecting my love of writing to morph my business aspirations. But, when the reviews were so positive, it became my passion. I loved it so much and I was writing constantly. My readers nominated me for awards within the genre and miraculously, I won a few of them. I was stunned, but encouraged. My readers were telling me that I should publish. My publishing journey is a longer story. If you want to hear that…I’ll tell you! Sure! Don’t Forget to Remember Me, Book #2 in the Trilogy, is about to publish. The eBook has been proofed and I’m waiting for the formatted version of the print book. When I go over it and approve it, and then it will literally be a week until the book publishes. I’m about 1/3 finished with the third book and hope to have it published by Christmas! I’m formatting another longer, unrelated novel to manuscript, and have three other stories in my head, screaming at me to get out! What is the inspiration behind your novels? I don’t really analyse that part because it’s different for every story. DFTRM began as a title that intrigued me and I built the story around it. On After Dark, it was the plot that evolved before the title. It’s never the same…but the most honest answer I can give is that my readers inspire me. Their words via email, tweets, DM’s and reviews spur me on like nothing else. If they want to read it…I will write it. Your novel has been the best I've ever read and has touched my heart like no other, why do you think readers feel emotionally attached to your characters? I think because I’m attached to them and it’s important to me to draw the readers into the pages. It’s important to make them feel, touch, taste, smell and see it in their minds eye. I want it to play like a movie in surround sound, not the two dimensions of black and white words on a page. Wow. What you just said was right up there! I have thousands of reader reviews and I’ve saved them all. I want readers invested, so when they say they are bawling their eyes out, shouting for joy, feeling every nuance my characters feel…then I’ve done my job. Have a thick skin. Reading is subjective and not everyone will like your book. (This includes agents and publishers). I had three publishers ask me for completely different revisions. What’s one person’s treasure is another’s trash, and there isn’t one damn thing you can do about it. There are also people out there that will have an opinion even if they’ve never read one word you’ve written. It’s hard to take sometimes, but just let it go. Believe in your story and in your skills…but keep working to get better. We can always get better. The most important thing to remember is this: It’s your story. Write it as you envision it and don’t let anyone make you change something that you don’t believe will improve it. Sometimes, there are too many cooks in the kitchen…but you’re the head chef and ultimately, the words on the page are your responsibility. Thank you! Your support, emails and reviews make my fingers fly on the keyboard and overwhelm my heart! Some of you have been with me for three years and others are brand new…I love and cherish each and every one of you. Hmmm… I was sickeningly good. I never did drugs, smoked or missed curfew. I earned good grades, went to college, crossed my t’s and dotted my I’s. I always considered my actions. I believe that was smart, but at the same time, I think being a little more carefree (on some things) might have been okay. The best thing I did was to stay true to myself, despite the doubts, insecurities and temptations that we are all faced with when growing up. This is my last year of being a teenager... :( *sob* is there any advice or something you think I should try or do to make it the best ever? Make good choices for your future, but don’t fret if you change your mind on what you want to do with your life. You never know where you’ll end up, but you have to embrace the journey. Live, have fun…and love with your whole heart; even if you get your heart broken. Why do you think I can write such gut wrenchers? Book: The Odyssy (Homer) I read it in tenth grade and it was an amazing experience. We spent the entire semester reading and dissecting the story and it’s sub plots. I loved every minute of it. Author: I have several…if I have to pick one; Jane Austin. What do think of of the interview? 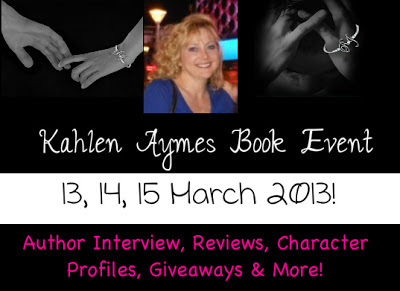 Have you enjoyed the Kahlen Aymes book event? Yes, I've loved this event! Kahlen Aymes is an amazing writer. She has written THE best love story, you feel every emotion that the characters are feeling and going through. I can't quit talking about how much I love Ryan and Julia's story. I can't wait to get my hands on A Love Like This!!! you are a new author to me. I love finding new author and books to read.